This is 5V 3A power supply to drive two USB based devices simultaneously. This power supply is design around LM2576-5.0 switching regulator IC and the main reasons to choose this IC is its low parts count, small heat sink requirements and its inbuilt current limit protection feature. 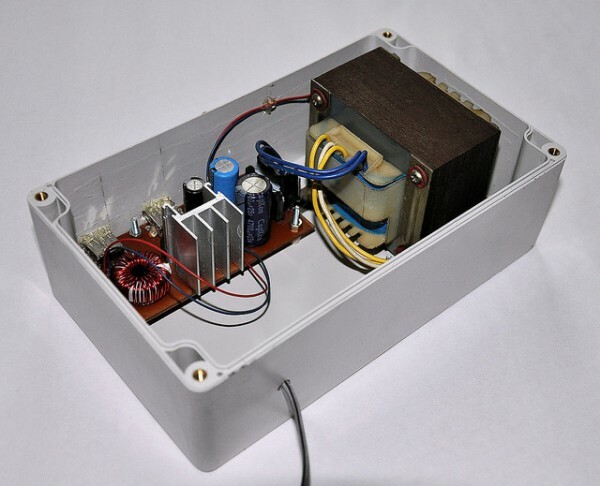 We specially design this power supply to work with development boards / single board computer (SBC) platforms such as Raspberry Pi, Banana Pi, BeagleBone, etc. This power supply can also be used to provide power to USB OTG peripherals over USB Y cables. We test this setup and got successful results with Huawei Ascend P6 mobile phone. Project info at Dilshan’s blog. All files are available at elect.wikispaces.com. This entry was posted on Tuesday, May 5th, 2015 at 1:49 pm	and is filed under power supply, USB. You can follow any responses to this entry through the RSS 2.0 feed. You can skip to the end and leave a response. Pinging is currently not allowed. 5 V * 3 A = 15 W. Effectiveness of transformer is at about 80%, LM2576 about 77%. Makes a total of 60%. So in goes 25 W, out comes 15 W and 10 W heat…. Will the closed plastic case stand? Is my calculation correct? Do I get a free PCB? Hobbyists who have access to better parts please look *carefully* at the thing before choosing to follow anything. LM2576 is at least 19 years old bipolar tech, the power switch is an integrated NPN transistor. Do your calculations fellas, 1.4V Vsat x 3A peak — there will be lots of heat… “small heat sink requirements”? Yeah, in 1996. Modern switching ICs are *cheaper*, pick one with a 3A FET switch, pick 150-300kHz switching for easy PCB design, heat will go way down, and the capacitor and inductor requirements will drop a lot too, so overall, modern parts will be _much_cheaper_. Or I would just buy a good power brick. Unfortunately the project author writes stuff that sounds nice but is dated at least back to 1996 for the switcher IC. Caveat emptor. The USB data lines are left unconnected, this isn’t USB compliant at all. Whatever USB device you connect, it would not draw more than 100mA. For a dedicated charging port (DCP), D+ and D- must be shorted. There are many chargers with two outputs available that are probably cheaper than the case alone that is used in this project. True that, there are ICs that can do multiple D+ D- signalling for powering or charging devices. Dual use: charger and door stopper. Very common in Sibiria! The LM2576 is older than that. We used it at a previous employer of mine in a design that was released in 1994 and I don’t think it was brand new then. If I remember right, the switching frequency is 52kHz, so you need relatively huge inductors and capacitors. It did have one thing I really liked that for a long time wasn’t available in any other “simple switcher” type of part. An “HV” version that could take up to 60V on the input. This was useful for controllers that had to run on a 48V electric forklift. But I believe they have better HV parts now.